The LG V30 is equipped with a P-OLED display, and LG made it clear that it's an 'active matrix' like Samsung's, but the 'AM' bit is just not part of LG's trademarks. The 'P', on the other hand, stands for plastic - the base layer on which the display is built is not glass but plastic. While we haven't recently been to a Samsung display manufacturing plant, the company's curved AMOLEDs should be plastic underneath as well. Also, LG used P-OLED displays back in G Flex and G Flex 2 days, when Samsung's curved AMOLEDs weren't yet all the rage. Anyway, the LG V30's FullVision display is in a 2:1 aspect ratio, as probably most high-end phones will be from this year on. Resolution is 1,440x2,880 pixels and that amounts to 537ppi, and that's plenty. When it comes to brightness, the V30 managed a little over 400nits with the auto brightness turned off. In auto mode, however, it's able to push 600+ nits, up there with the Galaxy S8. The S8+ can shine a little brighter, though. Unlike Samsung's AMOLEDs, the V30's screen does show some illumination in the blacks - not enough for you to see, but there for our testing equipment to spot. For purposes practical however, you can assume that contrast is infinite, or at least vastly superior to the best of LCDs. Minimum brightness is 3.3nits, not the nominal 1nit we've seen on occasion, but still perfectly adequate for nighttime viewing. Out in the sun the V30 posts high marks for contrast, out of reach for most LCDs, yet falling short of Samsung's finest. As is all too common, in the default 'Normal' mode whites are visibly shifted towards blue/purple. Average DeltaE in this mode is 6.2 with a maximum of 11.1 for 100% Red. In the other pre-set modes, whites are much better controlled (DeltaE 2-3) and average DeltaE is around 4, with only a marginal decrease in maximum brightness. There's also a fully customizable mode with sliders for color temperature and for the three primary colors so you can tweak the display to your particular taste. It needs to be said that the V30's color rendition degrades quite noticeably when viewed at an angle - it gets even bluer. We haven't observed this with recent Samsungs. 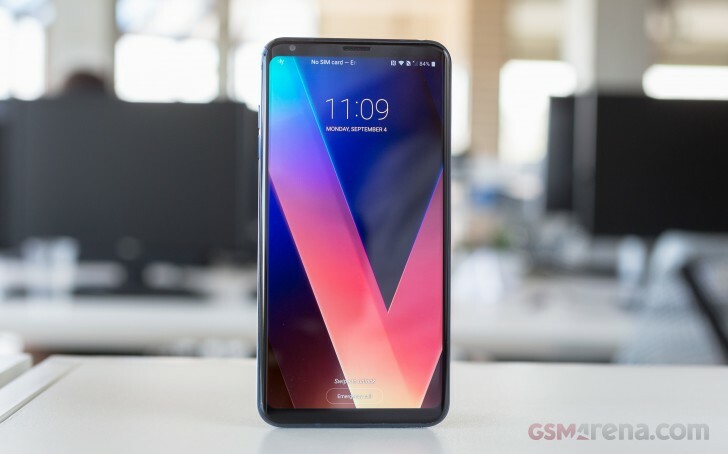 The LG V30 is powered by the Snapdragon 835 chipset and benefits from the wide range of connectivity features Qualcomm's SoC offers, and that includes Gigabit LTE (Cat.16 for downlink, Cat.13 or 150Mbps uplink). Single SIM and dual SIM versions will be available, ours happens to be the single SIM variety. Wi-Fi b/g/n over 2.4GHz and a/n/ac over 5GHz is supported. There's the latest Bluetooth 5 with improved range and speed plus aptX and aptX HD for those who are into high quality wireless audio. NFC support is another check mark on the spec sheet. Positioning is handled by GPS and GLONASS satellites. There is even an FM radio receiver. Charging and wired connectivity is using a USB-C interface and the V30 supports USB 3.1 for fast transfers. There's a 3.5mm jack so you don't have to live the dongle life, and also take full advantage of the built-in quad DAC. We finally got our hands on a retail unit and we used it to re-run all of our tests - we've updated the relevant review sections, battery life included. The LG V30 packs a 3,300mAh battery, same as the one inside the G6. While the G6 has a smaller display to power, its chipset is built on a less efficient 14nm process, compared to the V30's 10nm Snapdragon 835. On top of that, the V30's OLED display should theoretically be less power-hungry. The Samsung Galaxy S8+ relies on a higher-capacity 3,500mAh battery to power its 6.2-inch display, though the Galaxy Note8 makes do with 3,300mAh for a 6.3-inch screen. The OnePlus 5T with a 6-inch display, albeit FullHD, also has a 3,300mAh power pack. Then there are the 6-inch U11+ with a generous 3,930mAh capacity, and the Mate 10 Pro with 4,000mAh worth of juice. Those numbers only serve to get the conversation going, in practice longevity has proven to vary widely in seemingly illogical ways. The 33 hours of 3G call time, for one, is a truly impressive accomplishment on the V30's part, especially after our less than solid experience with the Snapdragon 835 in the past. The standby endurance is also above average. Web browsing endurance got a boost with the retail-grade firmware and the 9:30h we got out of the finalized V30 unit sounds much better than the 8:15h we measured on the pre-production model. Still not class-leading, though. On the other hand, video playback longevity ended up close to two hours less on the final unit than on the pre-production one. That said, with 15 hours on the clock, the final V30's result remains superb. Our endurance rating stand for how long a single battery charge will last you if you use the LG V30 for an hour each of telephony, web browsing, and video playback daily. We've established this usage pattern so our battery results are comparable across devices in a combination of the most common day-to-day tasks. The battery testing procedure is described in detail in case you're interested in the nitty-gritties. You can also check out our complete battery test table, where you can see how all of the smartphones we've tested compare and you can fine tune the ratio of the endurance rating ingredients to better match your own typical use.